The year is 1944. As the Battle of Tannenberg Line rages, Estonia finds itself helplessly trapped in the crossfire of two opposing forces. With the Red Army on the offensive, the severely outnumbered SS dig in to repel the Soviet advance on the Third Reich. Half of their infantry are local Estonian recruits, drafted from Siberian labor camps, and sent back to their homeland wearing enemy uniforms. 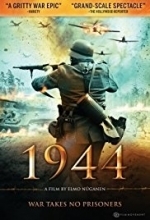 Forced to fight against their own brothers, these desperate young men now must find a way to survive one of the bloodiest conflicts of the World War II.